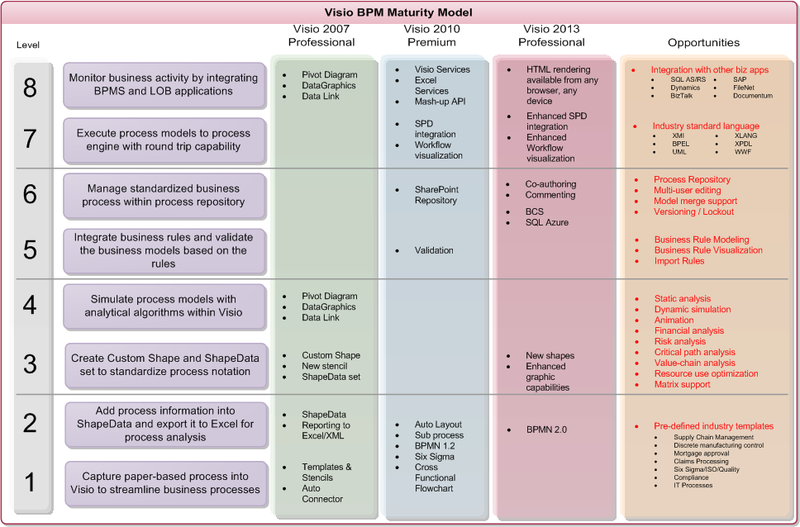 In my book, Microsoft Visio 2010 Business Process Diagramming and Validation (see http://www.visiorules.com/ ), I presented a table of the progressive maturity of BPM within Visio. I have now extended this diagram in the figure below to show how Visio 2013 increases this maturity level. I have just been running 2 day Visio 2013 Services introductory courses to Microsoft partners in Oslo and Copenhagen, and I think there has been a very positive response to the new capabilities of Visio 2013 along with SharePoint 2013. The two products together provide some great capabilities that should lead to exciting value propositions to business. New features include co-authoring of Visio files; commenting with or without the Visio client application; deeper integration with SharePoint Designer for SharePoint Workflows; and rendering of Visio files in high quality images, making them usable from any browser on any device. Update : Just got my latest copy of Redmond Magazine ( see http://redmondmag.com/ ). Great article about SharePoint 2013 and Visio 2013! Fun to find you have been in Copenhagen. Does Visio 2013 Pro natively exports bpmn 2.0 files?